Many people assume that working in an office is a safe and cushy job. While there are certainly many perks (such as A/C in the summer! ), the truth is that there are a number of hazards that office workers face every day and, in most cases, these hazards are easily fixed. Ergonomic hazards are unique. Most of us have the idea that a workplace hazard is an unsecured heavy load, high voltage wires or other obviously dangerous item or situation. Where an ergonomic hazard differs from these more traditional hazards is that an ergonomic hazard in the office may not necessarily be noticed immediately. In fact, a lot of ergonomic issues will build over time before causing pain. Carpal tunnel syndrome, chronic neck and back pain, frequent headaches, and more can all be symptoms of poor ergonomics in your office. If you spend much of the day working at your desk then you should ensure that your workspace not only has the tools to get the job done but to protect your body at the same time. What is an Ergonomic Hazard? Before you can start preventing injuries from ergonomic hazards in the office, you must understand what an ergonomic hazard is. Simply put, an ergonomic hazard is a situation or behaviour that can lead to any number of musculoskeletal disorders. Ergonomic hazards are usually repetitive and long-lasting actions that lead to painful injuries or conditions over time. Here are three simple improvements that you can make to help improve your office’s ergonomics and avoid ergonomic injury. People who work in offices spend upwards of 7 hours per day sitting at their desk. Having a great chair is essential to avoid ergonomic injuries. A lot of people simply don’t understand what makes a great chair when it comes to office ergonomics. Should you just buy the most comfortable chair and move on with your day? An ergonomic office chair provides crucial support in three areas. First to consider is back support. The back of the chair should curve with your back to support the back and shoulders. Without proper support, the lower back muscles often work overtime to make up for all of the sitting that happens throughout the day. Next, the cushioning on the seat of the chair plays a major role. This cushioning supports the spine as you sit. Over time, cushioning can compress or spread out and require replacing. No chair will last forever. Lastly, the position of your armrests can dictate your posture. When your arms are gently supported with your hands near your lap and your elbows at approximately a 90-degree angle, the stress on your neck, shoulders and wrist is minimized. A good office chair is only helpful if you actually make the most of the features built into the ergonomic chair. Leaning forward or slouching can render even the best office chairs useless. One of the main reasons people lean and slouch at their desk is because the devices they use are not placed correctly. Your keyboard, mouse, and computer monitor all play an important role in office ergonomics. When setting up your monitor you want the text to be in line with your eyes. Sit down in your chair with your feet flat on the ground and assess if your monitor needs to be raised or lowered. Next, look at your keyboard and mouse. If needed, raise or lower your keyboard tray or even move your keyboard and mouse to accommodate your height. Incorrect laptop height leads to additional pressure on the wrist and shoulders. Earlier we mentioned that most office workers spend more than 7 hours per day sitting at their desk. Having a great ergonomic chair is a good start but it doesn’t change the fact that you are sitting for a very large portion of your day. Find opportunities to do something other than sit. Set timers to go for a walk or do some stationary stretches. Sitting is one of the largest ergonomic hazards in the office and your chair can’t change that. You may also want to consider a height-adjustable desk that can alternate from standing to sitting and back. This allows you to change your position throughout the day and doesn’t require you to either sit all day or stand all day. Concern for ergonomic injuries should extend through all levels of your business. Employees need to look out for their own health. Managers should ensure that the health and comfort of their employees is made a priority. A happy, healthy team is a productive team. 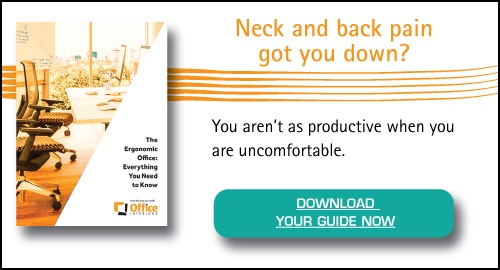 If you want to learn more about office ergonomics, check out our Guide to Office Ergonomics: Everything You Need to Know. 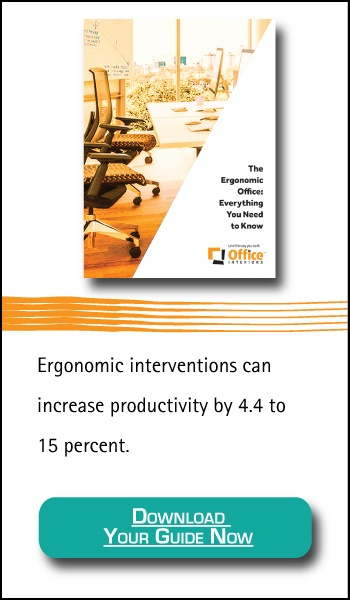 The Guide digs into some of the most important ergonomic products on the market and explores the financial impact that ergonomics can have on your organization.